Jared Ely near gas wells leased on his family's land near Dimock, Pa. His father, Scott, says the leases should have been clearer. ¶ Fewer than half the leases require companies to compensate landowners for water contamination after drilling begins. And only about half the documents have language that lawyers suggest should be included torequire payment for damages to livestock or crops. ¶ Most leases grant gas companies broad rights to decide where they can cut down trees, store chemicals, build roads and drill. Companies are also permitted to operate generators and spotlights through the night near homes during drilling. ¶ In the leases, drilling companies rarely describe to landowners the potential environmental and other risks that federal laws require them to disclose in filings to investors. ¶ Most leases are for three or five years, but at least two-thirds of those reviewed by The Times allow extensions without additional approval from landowners. If landowners have second thoughts about drilling on their land or want to negotiate for more money, they may be out of luck. The leases — obtained through open records requests — are mostly from gas-rich areas in Texas, but also in Maryland, New York, Ohio, Pennsylvania and West Virginia. In Pennsylvania, Colorado and West Virginia, some landowners have had to spend hundreds of dollars a month to buy bottled water or maintain large tanks, known as water buffaloes, for drinking water in their front yards. They said they learned only after the fact that the leases did not require gas companies to pay for replacement drinking water if their wells were contaminated, and despite state regulations, not all costs were covered. 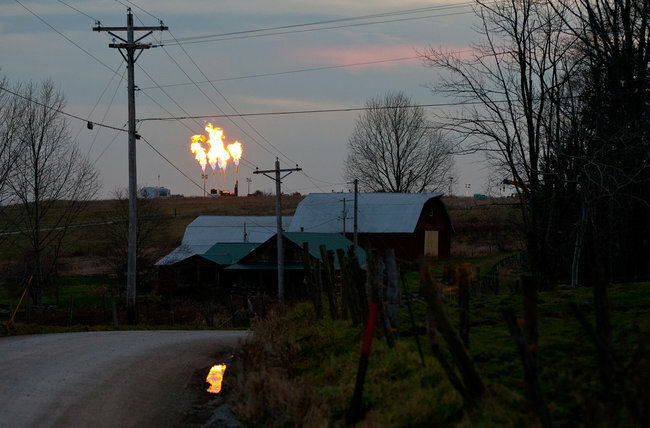 Thousands of landowners in Virginia, Pennsylvania and Texas have joined class action lawsuits claiming that they were paid less than they expected because gas companies deducted costs like hauling chemicals to the well site or transporting the gas to market. Some industry officials say the criticism of their business practices is misguided. Asked about the waste pits on Mr. Ely’s land in Pennsylvania, for example, George Stark, a Cabot spokesman, said the company’s cleanup measures met or exceeded state requirements. And the door-to-door salesmen, commonly known as landmen, who pitch the leases on behalf of the drilling companies also dismiss similar complaints from landowners, and say they do not mislead anyone. He said that his company’s leases ensure that landowners will get replacement water. The company also encourages landowners to visit an existing drilling site before signing a lease to get an idea of the potential noise and truck traffic. Some of the complaints about leases, he said, are just sour grapes from landowners who are envious about the amount of money they believe their neighbors are earning in bonuses and royalties. To be sure, many landowners have earned small fortunes from drilling leases. Last year, natural gas companies paid more than $1.6 billion in lease and bonus payments to Pennsylvania landowners, according to a report commissioned by the Marcellus Shale Coalition, an industry trade group. Chesapeake Energy, one of the largest natural gas companies, has paid more than $183.8 million in royalties in Texas this year,according to its Web site. Much of the money has gone to residents in rural areas where jobs are scarce and farmers and ranchers have struggled to stay afloat. Mr. Ely once worked for a company owned by Cabot on drilling sites in his area, until he was fired shortly after publicly complaining about Cabot’s drilling practices. But many landowners and lawyers say that gas companies are intentionally vague in their contracts and use high-pressure sales tactics on landowners. “If you’ve never seen a good lease, or any lease, how are you supposed to know what terms to try to get in yours?” said Ron Stamets, a drilling proponent and a Web site developer in Lakewood, Pa., who started a consumer protection Web site, PAGasLease.com, in 2008 so that he could swap advice with his neighbors as he prepared to sign a gas lease. Others have also taken steps to better inform landowners about the details in leases. In the past several years, the attorneys general in New York, Ohio and Pennsylvania have published advisories about the pitfalls of leasing land for drilling. State regulations also provide protections to landowners above and beyond what is in their leases. At least eight states specifically require companies to compensate landowners for damage to their properties or to negotiate with them about where wells will be drilled, even if the lease does not provide those protections. Asked about the leases, officials from Exxon Mobil, the largest natural gas producer in the United States, declined to comment. Jim Gipson, a spokesman for Chesapeake Energy, said any claims of damage can be investigated by the state and federal authorities and, he added, noise or other disturbances that may come with drilling tend to be brief. “The most frequently asked question we receive from our mineral owners is, ‘When are you going to drill my well?’ ” he said. Mr. Gipson said that most leased properties do not end up having a well placed on them, so those leases do not need added protections. But some consumer advocates and lawyers say that protections are needed for all leased properties, even those without wells, because drilling may occur underneath them. These advocates also say that landowners’ eagerness to start earning royalties has made them vulnerable to deceptive tactics by landmen. The landmen then claim that if you do not sign right away you will miss out on easy income because other drillers will simply pull the gas from under your property using a well nearby. Some landmen show up in poorer areas shortly before the holidays, offering cash on the spot for signing a lease. They might offer thousands of dollars per acre as a bonus to be paid shortly after the lease is signed. Royalties, which usually run between 12.5 percent and 20 percent of what the companies make for selling the gas, can mean tens of thousands of dollars per year for landowners. Jack Richards, president of the American Association of Professional Landmen, said his members follow a strict code of ethics. His organization also encourages landowners to ask questions before they sign leases, he said. “We promote open and honest communication between the landman and landowner before signing the lease,” he said, adding that the standard lease forms are written with some protections for landowners. Some leases, however, also include language that comes back to haunt landowners. “I thought I knew what the sentence meant,” said Dave Beinlich, describing a section that said that “preparation” to drill was enough to allow Chief Oil and Gas to extend the duration of his lease. In 2005, Mr. Beinlich and his wife, Karen, signed a lease for $2 an acre per year for five years on 117 acres in Sullivan County in north-central Pennsylvania. They soon realized they had gotten far less money than their neighbors, so they planned on negotiating a new lease when theirs expired in 2010. A day before their lease term ended, no well had been drilled on their land, but the gas company parked a bulldozer nearby and started to survey an access road. A company official informed them that by moving equipment to the site, Chief Oil and Gas was preparing to drill and was therefore allowed to extend the lease indefinitely. The Beinlichs have sued. Kristi Gittins, a vice president at Chief Oil and Gas, says that the company does not comment on pending litigation, but that its goal is to produce gas and it makes an honest attempt to develop the land it leases. But lawyers say that drilling leases are not like other contracts. 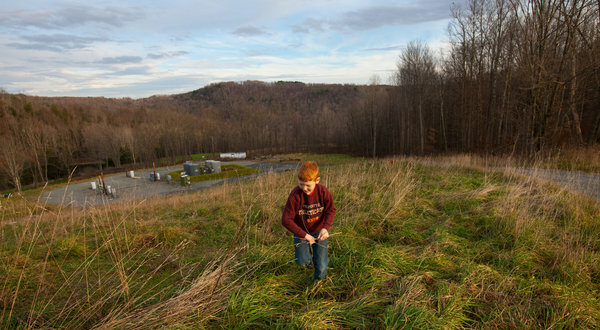 “You’re not buying a refrigerator or signing a car note,” said David McMahon, a lease lawyer in Charleston, W.Va., and co-founder of the West Virginia Surface Owners’ Rights Organization, adding that once a well is drilled, it can produce gas for decades, locking landowners into the lease terms. “With a gas lease, you’re permitting industrial activity in your backyard, and you’re starting a relationship that will affect the quality of living for you and your grandchildren for decades,” he said. Mr. McMahon and other lease lawyers say that unlike many contracts, oil and gas leases are covered by few consumer protection laws, in part because drilling has been most common in states with less regulation. Natural gas being burned off at wells near Dimock, Pa.
“When it comes to negotiation skills and understanding of lease terms, there is a gaping inequality between the average landman and the average citizen sitting across the table,” said Chris Csikszentmihalyi, a researcher at the Massachusetts Institute of Technology who created a Web site last year called the Landman Report Card that allows landowners to review landmen’s professionalism and tactics. Some lawyers also say that there are major differences between what drilling companies tell landowners and what they must disclose to investors. Under federal law, oil and gas companies must offer investors and federal regulators detailed descriptions of the most serious environmental and other risks related to drilling. But leases typically lack any mention of such risks. In New York, the duration of leases has been an especially contentious issue. As leases near expiration, some gas companies try to extend them, often by invoking “force majeure,” a legal term referring to an unforeseen event that prevents the two sides from fulfilling an agreement. In these instances, gas companies say the unforeseen event is the state’s repeated delays in releasing environmental regulations and issuing drilling permits. Force majeure clauses appear in as many as half the roughly 3,200 New York leases reviewed by The Times. Another important lease term is the Pugh Clause, said Lance Astrella, a lease lawyer in Denver. It is named after Lawrence Pugh, a Louisiana lawyer who started adding it to leases in 1947 to ensure that they would not be extended indefinitely without wells being drilled. Fewer than 20 percent of the more than 100,000 Texas leasing documents reviewed by The Times include such a clause, and very few of the leases from Maryland, New York, Ohio, Pennsylvania and West Virginia include the language. While the leases collected by The Times represent a small fraction of the more than 8 million oil and gas leases in the United States, experts said they illustrated issues that landowners need to understand. Mr. Astrella said that leases also typically lacked a clause requiring drillers to pay for a test of the property’s well water before drilling started, and landowners often do not think to do the tests themselves. If drilling leads to problems with drinking wells, landowners have few options if they want to prove that their water was fine before drilling started. For some landowners, it can be a costly mistake. “It’s been one expense after another since our water went bad, and the company only has to cover part of it,” said Ronald Carter, 72, of Montrose, Pa. Mr. Carter and his wife, Jean, said they signed a lease in 2006 for a one-time fee of $25 per acre on their 75 acres and annual royalty payments of 12.5 percent. The Carters live on $3,500 a month, including the $1,500 per month they average in gas royalties. But they had to spend $7,000 to install a water purifier when their drinking supply became contaminated in 2009 after drilling near their property. The Carters joined a lawsuit with about a dozen neighbors, including Mr. Ely, accusing Cabot Oil and Gas of contaminating their drinking water. Mr. Stark, the Cabot spokesman, said that his company was not responsible for any water contamination in the area and that Cabot’s studies showed that the gas seepage into the drinking water was occurring naturally. “All the testing we have been able to conduct show the water meets federal safe drinking water standards,” Mr. Stark said. In 2009, Pennsylvania ordered Cabot to provide the affected residents with water. For the Carters, the company has paid for bottled water and for the installation of a water buffalo next to their trailer. Mr. Stark added that his company had offered to pay for treatment systems to remove gas if it leaked into their drinking water. Mr. Carter said that even though Cabot had paid to provide him with bottled water and a water buffalo, he can barely afford his electricity bill, which doubled because he has to heat the water buffalo to make sure it does not freeze. Those expenses may soon go up. On Wednesday, Cabot stopped delivering water to the Carters, the Elys and others in Dimock after state regulators said the company had satisfied requirements of a settlement agreement with the state. Jeremy Ashkenas and Kitty Bennett contributed research. An earlier version of this article gave an incorrect url for Ron Stamets’ Web site. It is http://pagaslease.com. FORCE MAJEURE Typically refers to natural disasters or other events that are beyond a company’s control and can delay drilling plans. In New York, gas companies have used it to argue that leases should be extended beyond their original terms because of the state’s moratorium on certain types of gas drilling. ASSIGNMENT CLAUSE Allows a company to sell or transfer a lease to another company. Some landowners have complained that their leases have been sold to companies that are financially unstable or have poor environmental records. ON-SITE STORAGE Some leases allow the energy company to use land for underground storage of gas or drilling waste, sometimes from another property. PITS Many leases allow companies to place drilling waste into pits on the landowners’ property. Some lawyers say that leases should explicitly prohibit waste pits. EXTENSION OF LEASE Leases are typically for three to five years, but they often include clauses that allow the drilling company to extend the leases even if landowners want to renegotiate or cancel them. POST-PRODUCTION COSTS Some leases include language that allows the company to deduct certain costs of producing the gas before paying royalties. WATER TESTING CLAUSE Some lawyers say that landowners should add language requiring energy companies to pay for independent testing of the landowners’ drinking supply before they drill so that investigators can determine the origin of any contamination that might occur. PUGH CLAUSE Protects landowners from gas companies indefinitely holding rights to an entire parcel, even if only a small part of it is being used for gas drilling. INDEMNIFICATION CLAUSE Lawyers recommend that leases contain language exempting the landowner from all forms of liabilities stemming from the company’s activities. FACILITIES CLAUSE Often establishes the “setbacks,” or the distances that are required between drilling activity and houses, roads, wells or other structures on the property. Without them, the lease may violate mortgage rules that dictate how certain properties can be used.